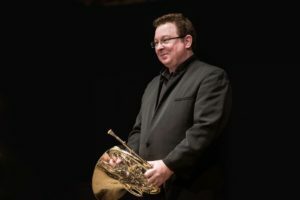 Hailed as “one of today’s superstars of the international brass scene Horn Virtuoso William VerMeulen has risen to become America’s leading horn soloist and preeminent teacher. He has been Principal Horn of the Houston Symphony since 1990 and has performed as a guest Principal Horn of the Chicago Symphony, Los Angeles Philharmonic, Cincinnati Symphony, St. Louis Symphony, Pittsburgh Symphony and St. Paul Chamber Orchestra. Prior to Houston he was employed with the orchestras of Columbus, Honolulu, and Kansas City. Mr. VerMeulen has been an Artist of the Chamber Music Society of Lincoln Center and participates as a performer and on faculty with the finest music festivals and chamber music presenters among which include: Chamber Music Society of Lincoln Center, Aspen, Music@Menlo, Banff, DaCamera, Orpheus Chamber Orchestra, Rockport, Joshua Bell and Friends, Tanglewood, Sarasota, Steamboat Springs, Santa Fe, Orcas Island, New World Symphony, Domaine Forget, Chamber Music Northwest, and the Sun Valley Summer Symphony. He has performed to critical acclaim on four continents as a soloist and chamber musician and is a popular artist at International Horn Society Symposiums where he is member of the Advisory Council. He also serves as a board member of the International Horn Competition of America. Along with the dozens of orchestral recordings in his discography are numerous solo and chamber recordings, including the complete Mozart Horn Concerti with Christoph Eschenbach and the Houston Symphony, Texas Horns featuring the Dallas and Houston horn sections and “The Christmas Horn” which features Mr. VerMeulen combined with his students from Rice University and conducted by Dale Clevenger. He has recorded much of the chamber music repertoire including Brahms Trio op. 40, Mozart Quintet K. 407, Beethoven Septet, Ravel Tombeau de Couperin for wind quintet, Schubert Octet, Spohr Nonet, Ligeti Bagatelles, Schoenberg Wind Quintet and the Bach Brandenburg Concerto no. 1. A champion of new music, Mr. VerMeulen has had numerous pieces written for him including concerti by esteemed American composers Samuel Adler, Pierre Jalbert and Anthony DiLorenzo and the horn cantata “Canticum Sacrum” by Robert Bradshaw. He performed the North American Premiere of James Horner’s last composition, ‘Collages’. He recorded the Canto XI by Samuel Adler for a CD called “First Chairs”. Among his awards and honors, Mr. VerMeulen received first prize at the 1980 International Horn Society Soloist Competition and the Shapiro Award for Most Outstanding Brass Player at the Tanglewood Festival. Regarded as one of the most influential horn teachers of all time, Mr. VerMeulen is Professor of Horn at the Shepherd School of Music at Rice University, Brass Artist-in-Residence at the Royal Conservatory of Music’s Glenn Gould School, Visiting Professor of Horn at the Eastman School of Music and on the faculty of the New World Symphony with students performing in numerous major orchestras throughout the world including the New York Philharmonic, Boston Symphony, Philadelphia Orchestra, Metropolitan Opera Orchestra, Berlin Philharmonic, Los Angeles Philharmonic, Chicago Symphony, Israel Philharmonic, Canadian Brass, Cleveland Orchestra, Seattle, San Francisco, Cincinnati, Montreal, St. Louis, Toronto, Detroit, Dallas and Houston Symphonies. Over 300 positions and offers of employment have been awarded to his students. In 1985 he was invited to the White House to receive a “Distinguished Teacher of America Certificate of Excellence” from President Reagan and the White House commission on Presidential Scholars.